High-quality, solid brass spotlight designed to accept LED MR16 Lamps. 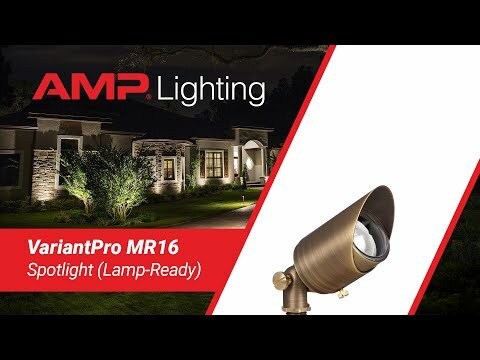 The solid cast brass AMP® VariantPro MR-16 Spotlight is the professional's go-to fixture for a full range of spotlighting needs. Designed to accept the AMP® line of LED MR-16 lamps, this compact fixture is engineered for durability and a number of high-performance features. •Cast brass construction with antique bronze finish for long-term durability and beauty. •Water tight, double silicone O-ring prevents water from entering the luminaire. •Convex lens prevents water from puddling, reducing hard water build-up and water intrusion. •Fully adjustable glare guard to prevent direct glare and to minimize light trespass and light pollution.